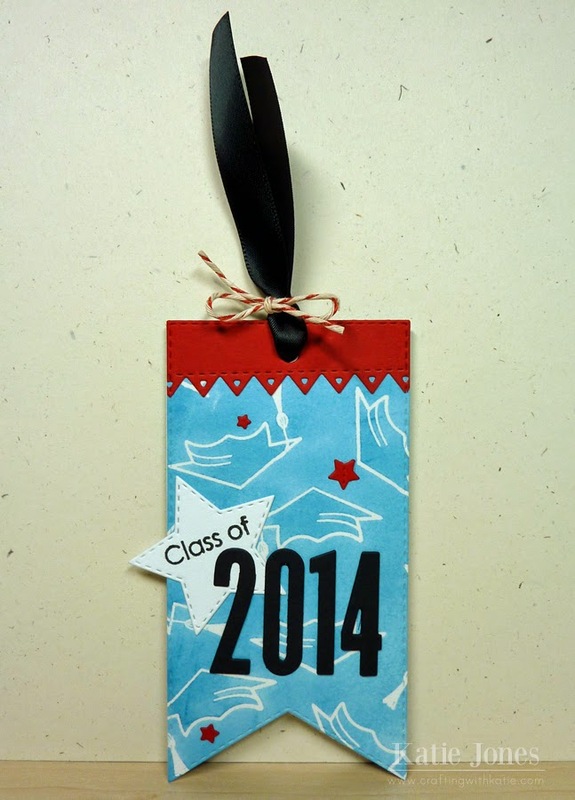 It's Tag It Tuesday with My Creative Time, and we're making graduation themed tags today! This is perfect timing for me, as my son graduates from high school in two weeks! I thought it would be fun to make a tag for his best friend that we could tie onto a little gift but also slide a surprise on the back. To make the background of this card, I used another new technique that I learned in Online Card Classes Watercolor for Card Makers class. 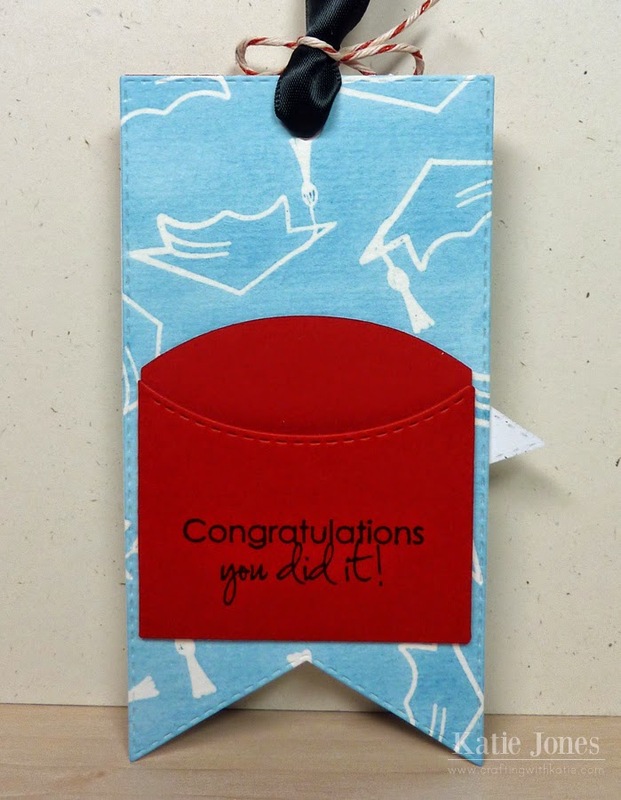 I took a piece of Strathmore Bristol paper and heat embossed some graduation caps from My Creative Time's Follow Your Dreams stamp set onto it with clear embossing powder. Then I used my Koi watercolors to watercolor over it. Once it was dry, I put the paper between two sheets of printer paper and ironed it with an iron set at medium heat, which lifted off the embossing, leaving a smooth finish! Then I die cut the tag shape using the Tag Dies, and added a red part on the top using one of the Fun Stitched Edges Dies, since my son's school colors are this blue and red. The white star was cut one with one of the 3 Star Stitched Dies and stamped with a sentiment from Follow Your Dreams. The numbers were made with dies from the 4x6 Journal Die, and I made the cute little red stars with dies from the 4x4 Journal Die + More. On the back I made a pocket with the Tag Gift Pocket Die and stamped another sentiment from Follow Your Dreams. It will be perfect for adding either a gift card or cash! Super cute tag and wow Miss Katie love your stamping great job!! All of your ideas and so clever love 'em all thanks for all the inspiration on ways to use Miss Emma's goodies you really are ever so talented and how fun your Son graduating and I know it's bitter sweet been thru it 4 times it's great time in their life but hated them to grow up...you know!! What a beautiful tag Katie! 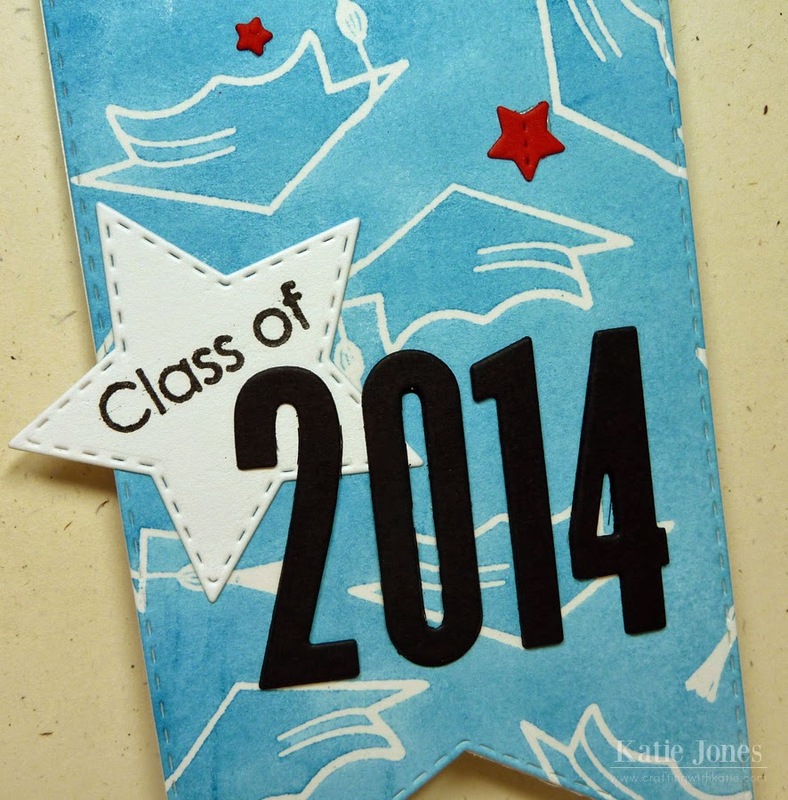 I just LOVE the look of the embossed grad hats and the sentiment front and center looks amazing!!! Katie ~ OH MY WORD!! I LOVE it! I LOVE how you created the tag!! I just LOVE the results from this technique too ~ I knew I should have taken this class! I can't even imagine pulling out my iron for clothes but I would TOTALLY pull it out for crafting especially when something looks as AWESOME as this!! LOL! Seriously though this is FABULOUS! Gorgeous tag Katie!!! I am loving all your water color projects! Katie, I'm loving all the watercoloring! This has taken your projects to a whole new level! is so pretty and I love the embossing idea! So simple and pretty. So glad we have the Follow Your Dreams set and I have used the cap many times. I like the clean and simple tag...love the edge die. Fabulous job!